New Delhi: It is not necessary to own shares by actively trading in market to reap rich premiums—even the cancelled share certificates of companies that closed shop long ago are in demand for their historical value. Hundreds of such share certificates are currently on sale over the Internet, including that of Imperial Bank of India, the oldest and largest commercial bank of the Indian subcontinent that later became the State Bank of India (SBI) in 1955. Issued in 1953, the certificate for 10 shares of the Imperial Bank of India, is available for Rs400 on EBay India, the local website of the world’s largest online auction giant. Share certificates for Bank of Bengal, which was set up in 1809 and is now a part of SBI, is also available online at prices ranging between Rs750 and Rs2,500 per certificate. A certificate which is more than 100 years old and was issued in 1878, is being sold for Rs750 on EBay India, while another 85-year-old certificate is available for $39.95 (Rs1,574) on Scripophily.net, another website dedicated to the sale and purchase of historical shares and bonds. Scripophily is the collection of old bond and share certificates as a pursuit or hobby, and the person who collects them is known as a scripophilist. The English word scrip means ownership right and the Greek word philos means to love. 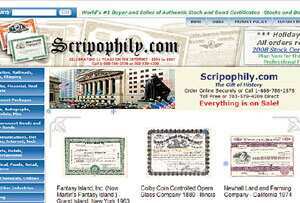 This hobby has now found a platform with e-commerce websites such as EBay and Scripophily. On EBay India, another certificate for Bank of Bengal shares worth Rs4,000 is available for Rs2,500. Another interesting share certificate currently on sale for Rs250, including shipping cost of Rs50, is that of Indian Copper Corp., an England-incorporated private sector company that was nationalized and made part of Hindustan Copper in 1972. On Scripophily.net, a 115- year-old certificate from the New Oriental Bank Corporation Ltd, which was issued in 1890, is being sold for $195 (Rs7,683). Founded in 1842 as a joint stock bank, Bank of Western India was reconstituted in 1845 and became Oriental Bank. The move apparently followed dissatisfaction among shareholders over the expense and conduct of its UK directors. Later in 1949, it acquired the Bank of Ceylon, but had to close its doors in 1892 after failing to record profits. According to EBay India, some of the popular collectible share certificates are of Assam tea companies and textile mills of Ahmedabad and Mumbai. The certificates currently available on the website include that of Wadia Woolen Mills issued in 1920, Indian Iron and Steel Co. Ltd issued in 1937, Anderson Wright Ltd issued in 1946, The Bank of Hindustan Ltd issued in 1942, Aryodaya Ginning issued in 1932, The Saraswati Ginning and Manufacturing Co. Ltd issued in 1921 and Shri Ambica Mills Ltd issued in 1968. According to scripophilist Pranav Gandhi who has listed 50 cancelled shares and bond certificates on EBay: “It has been very difficult to collect these certificates as people think these companies may restart over a period of time and hence might fetch them a good financial value then." But, scripophily has given a new lease of life to the certificates of many unsuccessful firms which went bankrupt, thus making them priceless.